Blockupy International Coordination sends a strong message of solidarity to all those who are fighting now against the labor bill imposed by the French government, a fight that is taken up by young and old, by industry and precarious workers, by migrants and students. It is contested not just in Paris, but in places all over France, it is contested not just by certain groups, but there is a movement growing that reaches across those immediately affected. Those who took the streets and the squares knew that – as in the case of many European projects – the Labor Bill will lead to a further general precarization – and that’s why the French government is trying to impose it so strongly by force. In fact, the French bill resembles other instruments of precarization and the dismantling of rights pushed under the austerity regime and its normalization in Europe. We know it fits in a cross-border reorganization of labour and life that requires a new level of workers’, civic and political organization. We know that what we need is a transnational opposition to all laws of this kind. Moreover, we denounce the police violence against the demonstrators and those who took the squares, we denounce the criminalization of the social movement and the government’s will to silence free speech. We denounce the government collusion with employers and the financial oligarchy. A scenario that we know too well which leads Europe to an economic, social and environmental dead end. However, people took the squares and streets. 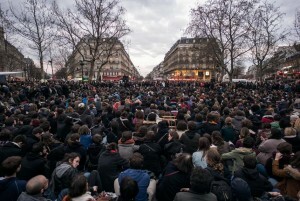 Opposition is growing, and the French government might know now that it made a mistake. We support all the struggles that widen and strengthen the opposition to this labor law as well as to the policies that led to it. We support the idea of a general strike on April 28th and any mobilizations that might happen in May, when the law will be presented to the parliament. In particular, we support the initiatives and meetings to be held on May 3rd – the beginning of the parliamentary proceedings – and May 7th/8th. We are seeing with great interest the birth of the movement #nuitdebout bringing about the convergence of struggles and a democratic challenge. The challenge in France as in Europe is crucial. What society do we want? How do we strike and struggle together against the austerity regime? How do we link our respective regional and national struggles and organize on a transnational level? Blockupy supports the convergence of struggles, the networks involved will take up #nuitdebout to their struggles – on May 1st and beyond – and make it their fight. Blockupy International sends its expression of solidarity to the movements building resistance – your struggle is our struggle – a struggle against a Europe of austerity and borders, a struggle for a very different Europe.